Vitamin C - do horses need it? I remember sitting in a Biochemistry lecture many years ago. The lecturer was explaining how Vitamin C (Ascorbic Acid) boosted immunity. She explained how white blood cells called monocytes and others called granulocytes actually carry large amounts of Vitamin C around, and then release it at the site of infection. I remember thinking how beautiful and how clever this was – so simple, so effective. It also caused me to look with great interest into what people like Linus Pauling (I think of him as a 60’s version of Patrick Holford) believed – that Vitamin C was capable of amazing things – from preventing cancer to curing the common cold. Since then, some of Pauling’s theories have been disproven. But some still stand and have been scientifically shown to work. So, of course I added Vitamin C to Immune mix when I was busy with that formulation. Despite being told repeatedly that Vitamin C supplementation is not necessary in horses, because they are capable (unlike humans and guinea pigs) of manufacturing their own Vitamin C.
Horses can and do manufacture Vitamin C from glucose in their livers. But, in times of growth, stress or disease, reserves are quickly depleted. And it is the immune system which suffers at this point, while the liver struggles to catch up. This is where supplementing with Vitamin C orally makes sense to me. Because this is precisely the time that large quantities are most needed. It is a potent anti-oxidant. This means that it helps to protect cells and their DNA from damage and mutations. This is how it helps to prevent cancer – at the very first, most basic molecular level. It is an important factor in Collagen production. Collagen is a protein, important in joints, skin, connective tissue, etc. It also has anti-histamine properties and reduces the histamine response in allergic reactions. 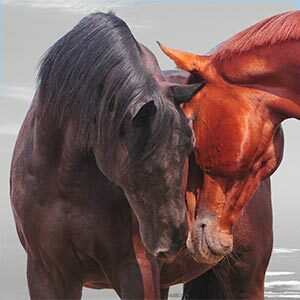 This will help your horse to be more tolerant of different allergens and less likely to develop allergic reactions. There is also no real downside to feeding Vitamin C. It is a water soluble vitamin, which makes it very safe – what the horse doesn’t use is mostly excreted in the urine. Hoffman, R.M., D.S. Kronfeld, J.L. Holland and K.M. Greiwe-Crandell. 1995. Preweaning diet and stall weaning method influences on stress response in foals. J. Anim. Sci. 73:2922. Lieb, S., K. Bowker, G. Lester, S. Ralston and P.E. Ginn. 1995. Effect of a nutrient supplement on the respiration, pulse, temperature, sweating, and serum electrolyte and amino acid levels of anhidrotic horses. Proc. 14th Equine Nutr. Physiol. Soc. Symp. 87.